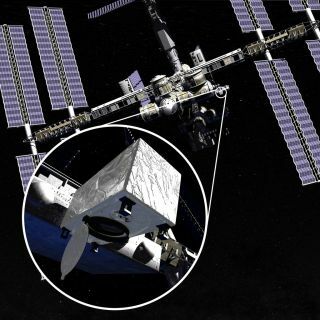 Artist's concept of NASA's Cloud-Aerosol Transport System (CATS) instrument, which will measure clouds and aerosols in Earth's atmosphere from its perch on the exterior of the International Space Station. A new instrument called CATS heading to the International Space Station this weekend doesn't have claws, but it does boast a powerful laser that could help researchers better understand climate change. NASA's Cloud-Aerosol Transport System instrument — which is set to launch toward the orbiting lab early Saturday (Jan. 10) aboard SpaceX's robotic Dragon cargo capsule — will track clouds and tiny particles of dust, smoke and pollution in Earth's atmosphere that influence climate. Once shipped to space, CATS will be installed on the outside of the station on the Japanese Experiment Module's exposed facility. Facing the Earth, it will shine a LIDAR (light detection and ranging) instrument on the atmosphere to measure where particles are, what sorts of particles are within view and how they are distributed. The space station is an especially beneficial site for the instrument because the outpost passes over most of the "primary aerosol transport paths" in the atmosphere, NASA officials said. Since the station also experiences 16 sunrises every 24 hours, it allows scientists to better observe how day and night affect aerosols and clouds. The orbits of many Earth-observation satellites tend to limit the crafts' observations to certain times of day, agency officials noted. CATS will eye Earth for the next six months to three years and will be controlled by the Payload Operations Integration Center at NASA's Marshall Space Flight Center. Dragon will transport other science gear to the station, including one experiment studying microbe adaptation to space, another examining how flatworms regenerate and a wearable technology experiment that will examine how changes in astronauts' heart activity affect their sleep. Saturday's launch will kick off the fifth of 12 unmanned cargo missions SpaceX plans to fly to the space station using Dragon and its Falcon 9 rocket under a $1.6 billion deal with NASA. SpaceX also aims to bring the Falcon 9's first stage back for a bold and unprecedented landing on a floating ocean platform. The dramatic maneuver is part of the company's effort to develop fully and rapidly reusable rocket technology.